When I think of antique model airplanes, I am thinking more about the actual models such as the WWI aircraft like the Nieuport, Albatross, Sopwith Camel, Spad and the Fokker than I am the antique “kits” from the 1960’s, 50’s and before. I recently visited the museum at the Academy of Model Aeronautics (AMA) in Muncie, IN and all I can say is that if you find yourself in that part of the country and you have ANY interest in RC model airplanes, that you owe it to yourself to visit. The place was amazing and you could spend hours learning about the very first vintage model airplanes, engines, accessories and more. There was truly a time in our hobby’s history when modeling was an art and a craft and there are hundreds of examples of this at the AMA Museum. Moving ahead to present day, you don’t need to be a master of balsa, silkspan and dope to own a large variety of antique model airplanes. Today, many of the world’s largest ARF and RTF model airplane manufactures have brought these models of yesteryear into the hands of even the beginning modelers. This is the electric powered Tx-R (Transmitter Ready) Nieuport 17 WWI Micro Park Flyer from Flyzone. Let’s say you have a passion for the Nieuport 17, then you can purchase one from Horizon Hobby; the E-flite Nieuport 17 250 ARF for around 80 bucks. Flyzone also has a micro Nieuport 17for less than $100. If you are looking for a larger version of this iconic aircraft then Maxford USA offers a 22% gas/glow powered ARF Nieuport 28 for around $290. The beauty of these models is that they come in either a ready-to-fly (RTF) or almost-ready-to-fly (ARF) format which means you can get in the air and fly these vintage RC models in a couple hours without the need to scratch build them or build from a kit. 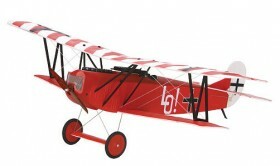 Another popular series of models from yesteryear, are the Fokker aircraft. E-flite has a version of this vintage aircraft called the Fokker DV 205 ARF which, as with the Nieuport, sells for around 80 bucks. Nitro Models sells the Art Tech Fokker Tri-Plane for $99 and it comes as an ARF. Great Planes has a Fokker Dr. 1 Tri-Planethat comes as an ARF and is full constructed from balsa and lite plywood. This model gives you the look and feel of a balsa aircraft that you might have built 40 years ago, but because it is an ARF, it can be fight-ready in a couple of hours. If you passion is antique model airplanes and you are in love with that vintage RC airplane look and feel but you don’t have the time or skills to build one from scratch, it is nice to know there are a lot of companies that offer ARF and RTF versions of these models that can get you in the air fast.